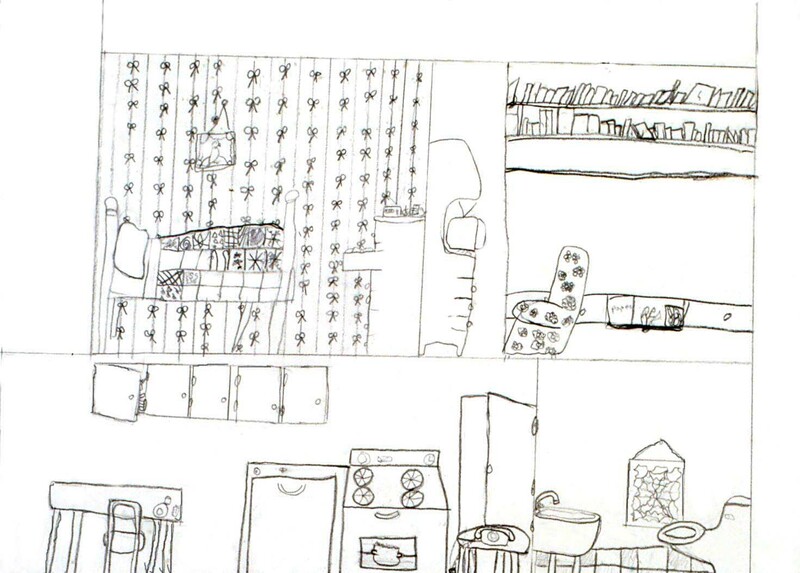 The children learn how to illustrate the inside view of a dwelling by looking at the cut-away view of a dollhouse. For ages 6 to 9. Plan 1 to 2 sessions. Have available the example or picture of a dollhouse. Set out the drawing paper, pencils, erasers, and rulers. 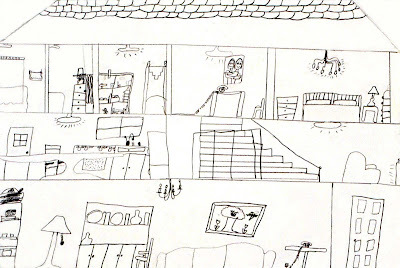 Explain to the children that they will be drawing the interiors, or inside views, of dwellings. Show the children the cut-away side of a dollhouse. Point out that the only visible part of the outside of the house is the line around its edges, called the contour line, and that the interior of the house is divided into floors and sections. Discuss ways the children might fill the sections of their dwellings with items such as furniture in the rooms, rugs on the floors, and pictures on the walls. 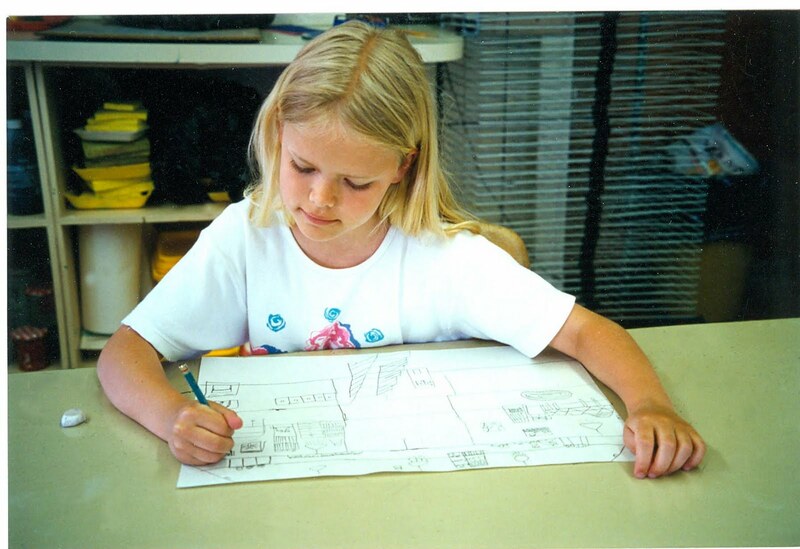 Encourage the children to include patterns, or decorative designs, wherever possible. 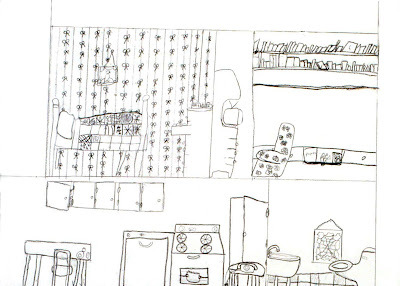 Have the children draw the dwellings and then use their imaginations to fill the interiors. 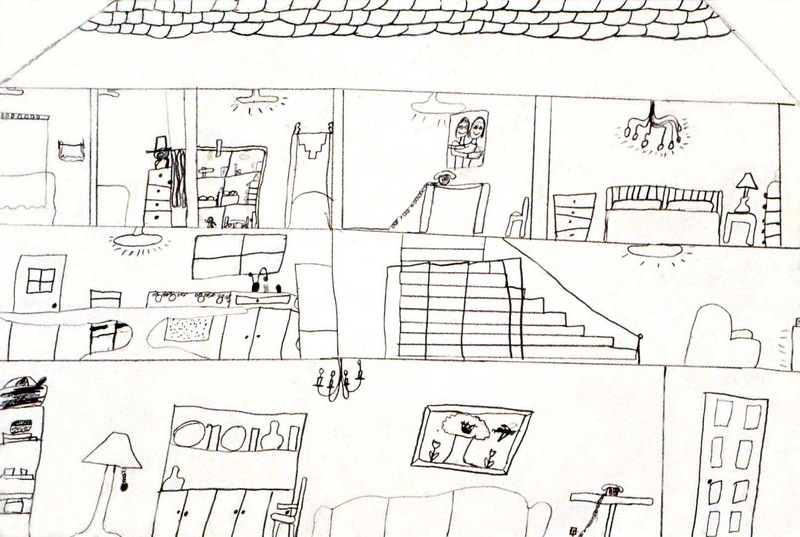 Although the drawings shown here are of houses, this project might include any type of dwelling that the children can fill with their imaginations. 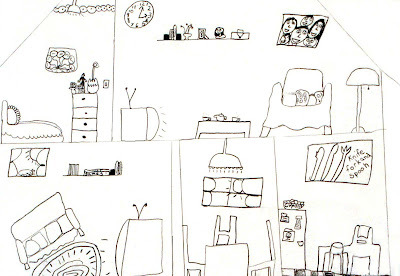 The joy of this project is in the details such as the bowl of "cupons" (coupons) and art work on the refrigerator in the first drawing; the nest of just-hatched baby birds in the picture above the couch in the second drawing; or the enthusiastic rendering of wallpaper in the third drawing. Do the contour lines of the dwellings fill the papers? Do the interiors of the dwellings include lots of details? Discuss how details and patterns add interest to the drawings. Can I add a third floor to my house? Should I draw a roof on my house? I’m going to draw an igloo. I drew a picture for the wall of my mother hugging me. You can decide the number of floors you would like to include in your house. Just be sure that all of the sections are large enough to include lots of details. If you have time, you can add some details to the outside, but remember that the most important part of this lesson is the inside of the dwelling. Remember to draw a cut-away view of the igloo and then what you might find inside of it. 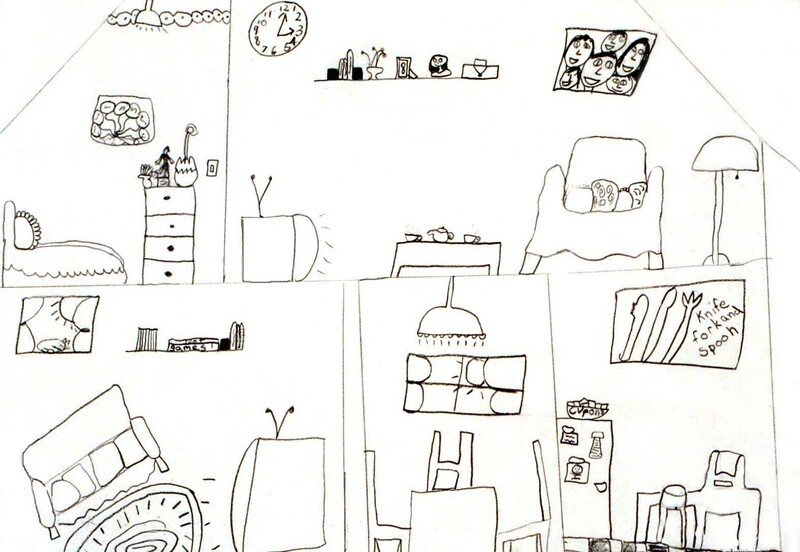 Its fun to look at the drawings and discover such wonderful details as a picture of you and your mother.